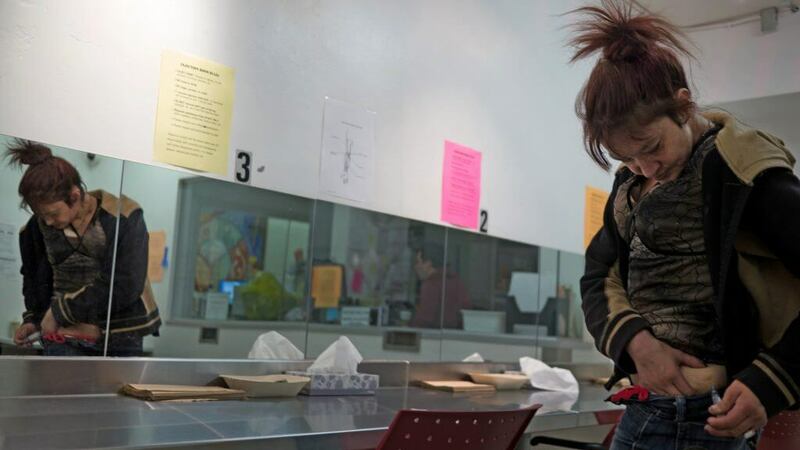 A woman, Cheryl, self-injects at Vancouver’s Crosstown Clinic. From Aaron Goodman’s The Outcasts Project. Except for a long line at the barbecue, where hungry older folk wait for a free meal, most people have left Oppenheimer Park for the day. But not Jim McLeod, who’s clutching a hot dog wrinkled with the cold, so engrossed in telling me his story that he’s forgotten about his dinner. It’s late February and we’re standing in Vancouver’s Downtown Eastside, the epicentre of Canada’s overdose crisis, talking about harm reduction—two words very much in vogue. McLeod gets his morphine from the streets, relying on dealers rather than doctors to manage his pain. But he considers himself lucky. The morphine he takes comes in an uncrushable pill, making it hard to adulterate. He can always tell if someone’s been sneaking in additives. It’s impossible to know what’s in other drugs. Fentanyl, a painkiller so powerful that only a few sand-like grains are needed for a lethal dose, has breached the illicit opiate supply. It’s found in everything from heroin to fake Oxycontin pills. Stimulants such as cocaine and methamphetamine aren’t safe either: One Vancouver journalist reported being offered “knock-down jib,” or laced meth, by a street dealer, while fentanyl-laced cocaine hit partiers in Ontario and B.C. last year. A 2016 Vancouver-based study found fentanyl in 86 percent of drugs tested. In B.C, lives lost to drug overdose nearly doubled over the last two years. In 2016, almost 1,000 people died. In the same period, Alberta saw 343 fentanyl-related fatalities, a three-fold rise in only two years. That’s comparable to diabetes, which consistently stars in the province’s top-10 lethal causes list. Eastern provinces aren’t exempt, either: According to reports, drug-related deaths in Ontario have more than quadrupled since 2000. Treat addiction like any other disease: That’s the seemingly radical idea activists like McLeod demand in the face of these fatalities. Calls to set up special clinics, prescribe heroin, and reform prohibition brought McLeod and 300 others to Oppenheimer Park, part of a nation-wide protest organizers called the biggest mobilization for harm reduction Canada has ever seen. The rally doubles as a memorial service; most in attendance clutch wooden feathers scrawled with the names of the dead. It’s not the first time drug users have insisted on their right to equal care. But they’re hoping, in the face of a national crisis, it’ll be the last. Main and Hastings might be Canada’s most notorious intersection. Hotels with crumbling facades hint at a once-thriving entertainment district; many have been converted into welfare housing with patchy hot water and pest problems. Theatres have closed. Walking past these buildings, it’s not uncommon to step around tents fashioned from umbrellas, dodge garbage thrown from windows, or hop over trash cans torn apart by salvagers. The sidewalks buzz with casual drug deals, and residents smoke and inject openly. The City of Vancouver, to its credit, largely defies traditional approaches to drug use—namely policing, shaming, and abstinence-only services. When I first arrived here last fall, I wondered why nobody was doing anything about the mayhem. I’d see needles in the gutters, people smoking meth under tarpaulin erected on the sidewalks, dealers hawking Valium and codeine at the bus stop. But like anyone else reading the literature, I learned that exhorting drug users to get clean at all costs wouldn’t help those living with severe pain, trauma, or mental illness. All the evidence I could find pointed to embracing the kind of harm reduction that’s blossomed here in the last two decades, such as needle exchanges, low-barrier housing, and cops that turn a blind eye to small-time drug trade. Perhaps the most convincing data for harm reduction can be found in Portugal, which decriminalized everything from cannabis to cocaine in 2001, effectively ending the drug war. The country saw a drop in drug use, HIV transmissions, and overdose deaths a decade later. While drug use is still punishable by prison time here, Vancouver too has moved away from the “hard on drugs” mentality. On Hastings, unlike elsewhere in Canada, health often comes before penalty. One activist I spoke to called the Downtown Eastside “a visual living affront to the way mainstream Canadians would like to see themselves,” a place where marginalized populations have come together and formed a thriving community—one with political clout, no less. Among the worn-out buildings and tent cities, it was here in the 1990s where drug users took harm reduction into their own hands, opening illegal injection sites and forming needle distribution teams who would comb alleys to make sure everybody had a clean rig. Four years after opening, a study out of Crosstown found heroin therapy lowered use of street drugs and crime, allowing patients to get their lives on track without quitting opiates. Canada legalized prescription heroin last year, but advocates say accessibility has yet to catch up to the law. Gagnon, who steadfastly believes in the harm reduction philosophy, warns that some doctors aren’t trained in the science—or ethics—underlying these measures, and may not feel comfortable prescribing heroin to patients. “We can’t expect health care providers to embrace harm reduction across the board,” she says. Aside from Crosstown, harm-reduction services stop short of supplying the drugs themselves. But activists say that’s exactly what should happen to end the overdose crisis: regulated drugs, accessible to anyone who decides to use them, including those who only indulge recreationally. They’ve floated the idea to Justin Trudeau during his recent pilgrimages to B.C., but unlike cannabis, full regulation of narcotics has proved too radical for him to support. In 2015, Trudeau told a reporter he doesn’t believe harm reduction entails the decriminalization of “harder” drugs such as heroin. “Despite some of the examples around the world, I don’t think it’s the right solution for Canada now or ever,” he said. A year later, Trudeau told the Vancouver Sun that “more work has to be done” to determine whether regulating illicit drugs is the best course of action. That position strikes Gagnon as a blow to harm reduction work. Other experts agree. “We should have the primary goal to reduce drug-related harm, and we should be open about the best ways to reach this,” says Dr. Jürgen Rehm, director of addiction policy at the University of Toronto’s School of Public Health. Insisting on abstinence as the only form of treatment—think ideology-based 12-step programs like Narcotics Anonymous—means that patients like McLeod, who use street drugs to medicate for pain and past trauma, will inevitably fail. Back on Hastings, I meet up with Karen Ward, a woman in a black hoodie frowning into her cigarette. We’re outside the Vancouver Area Network of Drug Users, a dilapidated storefront converted to a user-run resource centre back in 1998. They hold meetings every week, and have recently been letting users inject in a back room—their own unsanctioned injection site, an emergency measure to prevent more deaths. When we go inside, the front desk is plastered with funeral notices. For people like Jim McLeod, who may always use opiates, granting these demands could one day save his life, too. When we part ways in Oppenheimer, I pass under a row of leafless trees, wooden feathers from the rally now tied to their boughs. Almost a thousand of these makeshift monuments dance in the wind, names flashing in the sun. Each one a reminder of a human life lost not to drugs, but to radical policy: prohibition, the biggest killer of all. * UPDATE (MAY 30, 2017): Since this story was published in our May/June 2017 issue, Bill C-37 has passed, and four supervised injection sites have been approved. This paragraph has been updated to reflect these changes, including an updated quote from Minister Philpott’s press secretary Andrew MacKendrick. Malone Mullin is a writer and journalist from Toronto. After a long period of ivory-tower disillusionment, she's discovered meaning at the juncture of science and society. She’s lived in Edinburgh, van-camped across North America, and now studies journalism at the University of British Columbia. She and her husband proudly call the Downtown Eastside home. Follow her @4evamalone.